The McGowan sisters, Ryan and Casey, never stop thinking of their mother, Stacey Sennas McGowan, who died on 9/11. The texts begin early every Sept. 11. “Thinking about you,” they read. The McGowan sisters wake up thinking of their mother. It’s a day to get over with, peppered with images of the World Trade Center on television and social media. It’s a day to get through, as others are reminded of a tragedy that Ryan, 19, and Casey, 18, of Newport, R.I., think about every day of their lives. But it’s no longer a day of mourning. It’s been recast as a day to honor the legacy of their mother, Stacey Sennas McGowan. She was one of almost 3,000 lives lost on Sept. 11, 2001. This fall, on the anniversary of the attacks, both of her daughters are students at her alma mater, Boston College. Ryan is a sophomore. Casey is a freshman. Their mother graduated in 1985, an economics major. She loved lacrosse and served as the team captain. 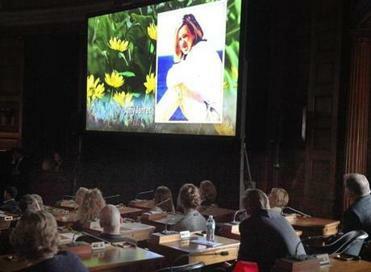 “Her absence is in itself a presence in our life,” Casey said of her mother. Both wrote about the impact of their mother’s death in their college essays. Casey remembers that she used to be anxious in the week leading up to 9/11. They dealt with people glancing their way at the mention of the day. Their friends’ mothers took them to mother-daughter dances. Their father worked from home as a single parent. Among the most emotional moments of the event was a reading of the names of each Mass. resident who died in the 2001 attacks. Family members sought solace in their own way. Their grandmother began to referee lacrosse in their mother’s hometown. The family began visiting Block Island with two other families of Boston College alumni. Year after year, they’d repaint a stone with the words, “We love you Mom.” It was the last place the family visited together before she died. Boston College was where Stacey Sennas met their dad, Tom McGowan, where they fell in love living across from each other in the red dorms nicknamed “the mods.” It was where the couple went for runs on a nearly 2-mile path around the nearby reservoir. As soon as Casey reached the Chestnut Hill campus in August, she ran the res to feel what it was like to follow in her mother’s footsteps. To know stories from their mother’s youth is to add dimension to a woman they only knew for the first few years of their lives. Childhood memories are scattered, but precious. There were frequent sing-alongs from their car seats, mom at the wheel, and Counting Crows on the radio. Friends see Stacey reflected in her daughters. There’s something measured and cautious in Ryan’s step. She walks like her mother, so she’s been told. And her sister’s smile is “just like Stace.” Casey looked to Ryan for strength, even as a little girl with a slight speech impediment. She’d always check with her big sister. As the oldest, Ryan tried to teach Casey values she felt her mother would want instilled. She remembers vividly when her father took them upstairs on Sept. 11, 2001. Ryan, 5, and Casey, 4, spent the day with the nanny in their New Jersey home. Their mother was a managing director for investment banking firm Sandler O’Neill + Partners. Her office was on the 104th floor of the south tower. Their father kneeled down and picked them up. Casey doesn’t have many memories, but she’s interviewed family members. She wrote about her grandfather coming home physically and emotionally exhausted three days after 9/11. He’d been out walking in the streets of New York with hundreds of others. The girls’ favorite place is a 9/11 memorial labyrinth tucked away near the entrance of Boston College. They visited the contemplative circle on Friday. Their mother’s name is engraved in stone with 21 other Boston College alumni. Ryan comes here at least once a week to think, pray, walk the labyrinth, and to talk to her mother. They remember her in the sound of church bells, in the memorial lacrosse game played every year at Stacey McGowan’s high school in Nyack, N.Y. 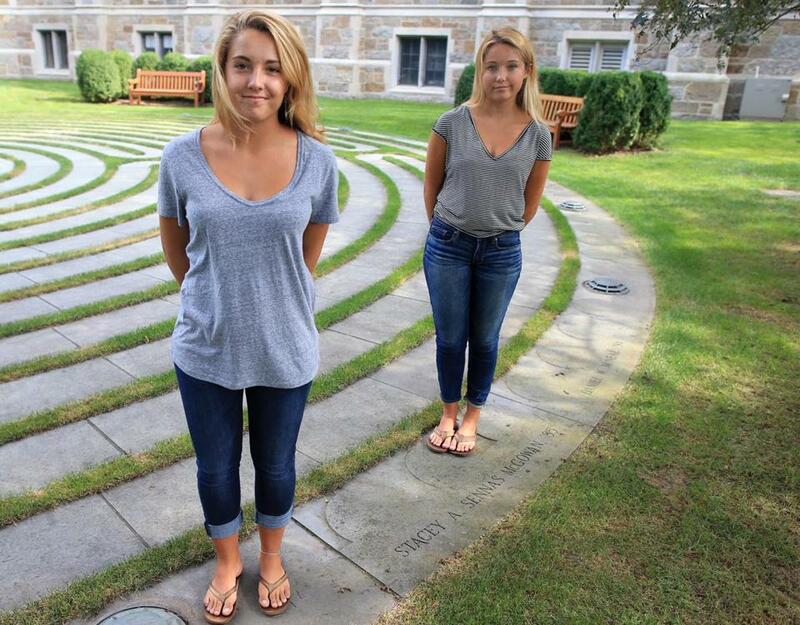 The girls’ favorite place is a 9/11 memorial labyrinth tucked away near the entrance of Boston College, where their mother’s name is engraved. Cristela Guerra can be reached at cristela.guerra@globe.com.